Excellent. And according to EAC devs it should be also already whitelisted for EAC-powered Rust and Squad games. And it may take 1-4 weeks to get it whitelisted in the rest EAC-powered games, where update cycle depends on the games themselves. Running RS2 win 10 x64, riva tuner causes issues. Some apps wont start if its running, the second i add the add to riva tuner exceptions / disable riva tuner, they instantly start. Any ideas guys? That's why exclusions list exists. And please avoid posting in this thread anything unrelated to polishing new version's functionality, it is not intended for "how do I use it" related questions. Sure it does, using it right now as a Temporary solution. How is a bug report not related to polishing new versions functionality? it is not intended for "how do I use it" related questions. Sure it is. Besides this is not a "how do I use it" question, this is an issue report monitored on Creators Update which is directly related to current software version. I asked once, ask twice but there will be no third request. Please don't spam new version development thread with your "bug reports". But Unwinder it is a worthy bug report. On the anniversary update I never had an issue with RTSS causing apps to fail with d3d9.dll error being the cause. With the creators update it lists d3d9.dll as the cause of the crash an the application never opens. No need to be defensive something changed from anniversary to creators to cause this. RTSS beta 16 in anniversary no issues creators is where it starts. Probably something to keep an eye out for as they changed something related to the d3d9.dll and hooking in the creators update and I dont think black listing every d3d9 app is the real answer here. We love your work and we are trying to bring to your attention worthy bugs. This is a a bug caused by the windows update not your app but you will probably need to take a peek as whats happening as a lot of d3d9 games will be having issues which defeats the purpose of having an osd for d3d9 games. I asked once, ask twice but there will be no third request. Haha is that a threat? Funny man. Go for it, best you can do is ban me, i'll make a new account. I don't spam, I report. Know the difference. Please don't spam new version development thread with your "bug reports". So bug reports are Unrelated to New Version Development? That's very interesting, you seem to contradict yourself unless new versions feature will be "no support for Creators Update". I think he has a point. Are you trying to report a problem with the beta version of AB/RTSS? If not, this is not the correct thread. Creators is working as usual here, been using it since some months back via Insider though I do set up exclusions but that's primarily to not have the OSD monitoring pop up on software such as NotePad++ it hasn't caused anything to crash. That's also what the "i" button / icon in Afterburner is used for, pressing shows info such as detected running 3D processes which you can then use to set up exclusions or other profile setting. I just take one of the templates, copy it and rename it as exclusions mostly just contains. Just some basic advice, probably nothing new but I can definitively recommend setting up exclusions based on what AB / RTSS detects and tries to monitor if you do not want said software to be monitored. As for AB 4.4.0b6 and RTSS 7.0.0b16 there's not much else I can say about them, been working well here since several releases back now, glad to hear about the recent update for anti-cheat software though as that will help a lot once the games using said anti-cheat solutions are updated. New customization features are interesting too and it's nice to see a new skin for RTSS after using the default for a long while now, both are functional of course but I like this new design more. No, it was a fair request for a man able to think and respect developer's decision. This thread is dedicated to new functionality development, if you don't know how to use application - please create new thread where someone can guide you. I don't need to repeat trivial application usage related things in development thread, with each new OS reinstall there are nice users who don't perform a clean install of RTSS and spam forums with the same issues. It was discussed a LOT of times and it is RTFM issue. And you could easily solve it by searching the forum instead of stealing my time and nerves on dealing personally with you. And you're acting like a kid thinking that your problem is the center of universe and stealing anyone's attention and forcing me to comment your "issues". Please don't come back until you learn to behave differently, you're really crossing red line. Just copy it to the "Profiles\Global" file instead of editing the ProfileTemplates default, should work. Check if beta 17 is addressing the issue. If not - give me the link to that installer. That is all we were trying to let you know about man. We love the work and want to help you make it the best it can be. Thank you for updating it! - RTSS must be started before an UWP 3D application to provide automatic injection and On-Screen Display rendering. However, you can optionally define “Show On-Screen Display” hotkey in RTSS client applications (i.e. MSI Afterburner) and manually inject any running UWP application via pressing this hotkey even if you start RTSS during UWP application runtime. - Currently the following UWP titles are supported officially: Gears of War 4, Gears of War Ultimate Edition, Forza Horizon 3 (please read notes below), Forza Motorsport 6: Apex (please read notes below), Minecraft Windows 10 Edition, ReCore, Ori and the Blind Forrest Definitive Edition. Other UWP titles were not tested at all, but may also work. - Currently Forza series games may hang on startup if OSD is displayed during loading the game. To prevent that, RTSS includes application specific profiles for both Forza Horizon 3 and Forza Motorsport 6: Apex applications and disables automatic injection and OSD rendering for it. However, you may safely manually display the OSD in Forza series games via pressing “Show On-Screen Display” hotkey, but it is strongly recommended to do so after Forza Horizon 3 or Forza Motorsport 6: Apex finish loading into the main menu. 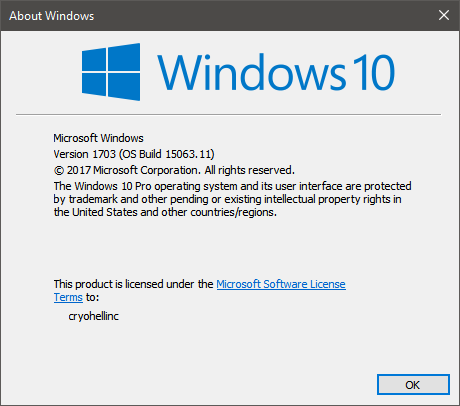 This is broken in Windows 10 Creators Update RTM Build (Released to manufacturing build which hits peoples computers on Tuesday the 11th.) It causes games like GTA V to crash on launch. Did you try beta 17 posted a few posts above? It supposedly works with CU.